Good jobs change lives. The New ERA Scholarship allows RMU to create a real impact in Chicago by education students and putting them on a path for employment success. 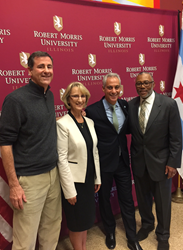 In a press conference last week, Mayor Rahm Emanuel joined Robert Morris University Illinois (RMU) and Chicago Public Schools in announcing a unique partnership and a significant opportunity for graduating seniors. The New ERA Scholarship, offered through RMU, will engage 300 students in college and career opportunities over the course of the next six years. RMU also announced a new partnership with Wells High School to offer dual credit courses and college readiness experience to high school students. The New ERA Scholarship will be jointly funded by RMU and private philanthropists, jumpstarted by a donation from real estate developer and philanthropist, Michael Alter and the Alter family. The vision for the New ERA Scholarship is to transform lives and Chicago communities by helping to ensure graduation and employment opportunities for 300 low-income African American students from the Chicago Public Schools (CPS) over the next six years. The announcement of this scholarship coincides with a new partnership formed between RMU and Wells High School. Located at 936 N. Ashland, Wells is the second Chicago public high school to take part in a partnership program with Robert Morris. Initiated by Mayor Rahm Emanuel, the program provides college credit and higher education experiences for high school students through dual credit courses, as well as hands-on college readiness experiences, campus visits, seminars and mentorship programs with RMU. The university expects to start the program with Wells in 2018. Steinmetz High School on the city’s northwest side is in the second year of its partnership with RMU. The presence of RMU at Wells will provide students with greater awareness of the New ERA Scholarship and the RMU commitment to educating students for promising careers. Robert Morris University has a long-standing record of bridging the gap between academia and the workplace with a structured, career-centric education and curriculum. Seventy-eight percent of RMU students pursuing a bachelor’s degree graduate, and ninety percent of those students complete their degree in less than four years. In total, 75% of RMU students are employed at graduation. Today, RMU graduates nearly twice the national average of low-income students based on PELL eligibility—61% versus 32%. With the Alter family’s $1.2 million gift, 40 students are already funded for the first New ERA cohort spanning four years from 2018 to 2022. With the additional support of private donors, the newly-created scholarship hopes to support 100 students annually. Each student will receive $5,000 annually to cover the remaining “gap” after RMU’s grant of $7,100, the MAP and Pell Grants, and the Federal Stafford loan. This will enable financially under-resourced students to graduate and enter the workforce, without being encumbered by severe debt. The 2017 Chicago Public Schools graduating class received a record-high $1.24 billion in scholarship offers, $80 million more than 2016. CPS students have more than tripled the scholarship award amount since 2013 when the graduating class earned $400 million. The increase in scholarship gains reflects the district’s continued efforts to provide all high school students with the tools and support needed to make the scholarship search and application process accessible and successful. For those looking for more information or to join the New ERA Scholarship campaign, contact Robert Morris University directly.